You found your dream car! Find the best way to pay for it! Leasing is like renting a car for a fixed term. You make monthly payments and at the end of the term you return the car and start the process over again with a new car. Financing a car means buying it with the help of an auto loan. You make monthly payments and once the loan is paid back you own the car. When buying a vehicle, your monthly payments go towards repaying your lender, plus interest. Unlike leasing, where your leaser owns the vehicle and you continue to pay monthly for the length of the lease. In general, leasing payments are lower than finance payments. When you lease, you’re not paying for the entire vehicle but rather the value you use up for the time you’re driving it. In the short term, based solely on monthly payments, it’s typically cheaper to lease than to finance. The advantage of financing a vehicle is once you’ve paid back your auto loan you own it and no longer have to make monthly payments. Plus, you get the benefit of any residual value if you decide to sell or trade in your car in the future. There are other factors that can influence the value over time. When you own a vehicle, you assume responsibility for major repairs whereas leased cars are typically covered by a warranty but leasing can come with all sorts of surcharges– like mileage overages and excessive wear and tear fees. It’s ultimately up to you whether to lease or buy. Some people prefer to drive a new vehicle every few years even if that means limiting their mileage. Others prefer the freedom of ownership and being able to drive as much as they’d like and customize their vehicle however they want. To determine if leasing or buying is right for you, do your research. 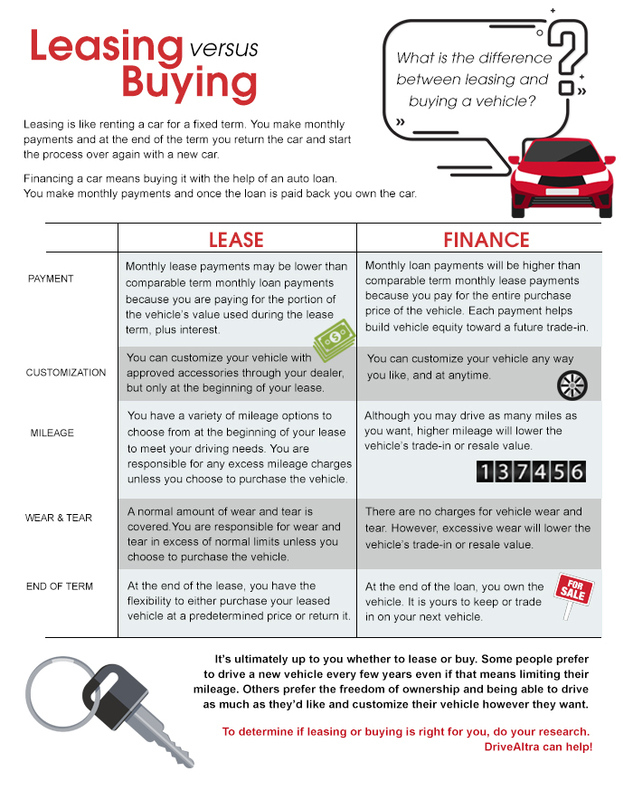 What is the difference between leasing and buying a vehicle? Leasing is like renting a car for a fixed term. You make monthly payments and at the end of the term you return the car and start the process over again with a new car. Financing a car means buying it with the help of an auto loan. You make monthly payments and once the loan is paid back you own the car. When buying a vehicle, your monthly payments go towards repaying your lender, plus interest. Unlike leasing, where your leaser owns the vehicle and you continue to pay monthly for the length of the lease. In general, leasing payments are lower than finance payments. When you lease, you’re not paying for the entire vehicle but rather the value you use up for the time you’re driving it. In the short term, based solely on monthly payments, it’s typically cheaper to lease than to finance. The advantage of financing a vehicle is once you’ve paid back your auto loan you own it and no longer have to make monthly payments. Plus, you get the benefit of any residual value if you decide to sell or trade in your car in the future. There are other factors that can influence the value over time. When you own a vehicle, you assume responsibility for major repairs whereas leased cars are typically covered by a warranty but leasing can come with all sorts of surcharges– like mileage overages and excessive wear and tear fees. It’s ultimately up to you whether to lease or buy. Some people prefer to drive a new vehicle every few years even if that means limiting their mileage. Others prefer the freedom of ownership and being able to drive as much as they’d like and customize their vehicle however they want. To determine if leasing or buying is right for you, do your research. DriveAltra can help!